What do you want to do for our anniversary? Where should we spend it? Where in the world would be romantic and fun?! To be honest, when it came to deciding where we should spend our anniversary, and what special activities we should do for it, we were both stumped. We’ve been together for ten years now, with eight of those years spent living and travelling abroad. What could we do that would stand out and be memorable for this occasion? When we finally decided on Greece for our 10 year anniversary destination, we knew it was the right choice. 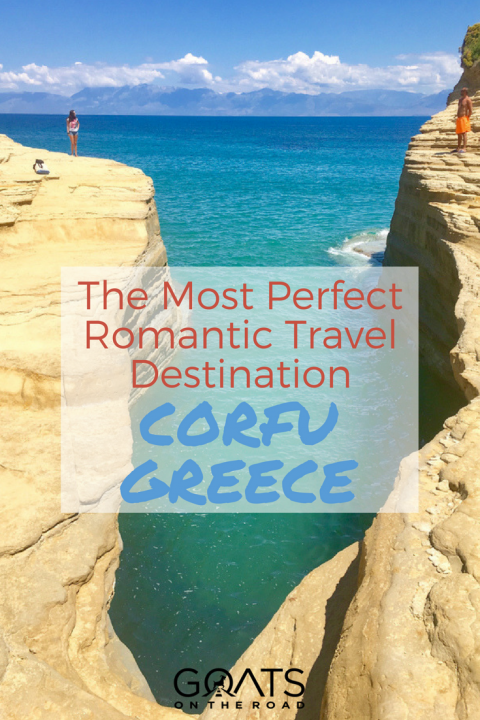 When it comes to romance, Greece is the ultimate country! Having just spent some time in Zakynthos and Kefalonia, we were excited to see what the northern Ionian island had to offer for our special celebration. 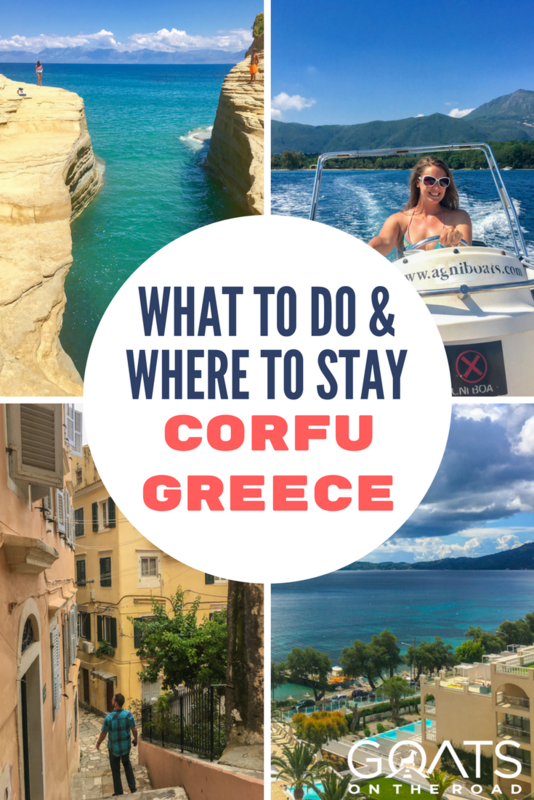 Don’t miss our traveller tips and our video from Corfu at the end of this post! Corfu is known for being a more cosmopolitan island than its neighbours, complete with numerous hotels, highly acclaimed restaurants, and unique lounges & bars. Having said that, this island is also home to a UNESCO listed capital, ancient monasteries and a rugged interior. Plus, the traditional practices of olive oil and honey production feature prominently on Corfu. This fusion of modernity, history and nature was something that we were excited to discover. 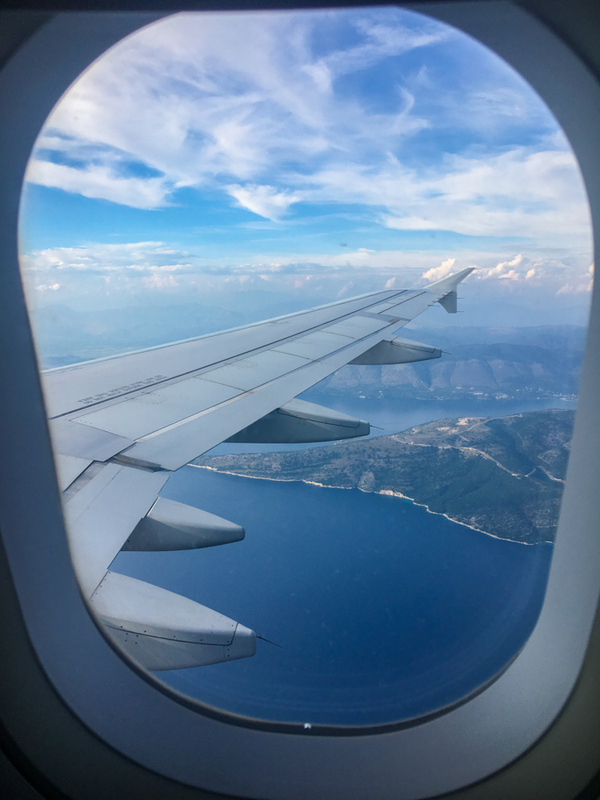 We arrived on Corfu Island after a quick flight with Aegean Airlines and continued with our usual routine of picking up a rental car. 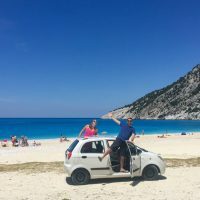 As with the rest of the islands we had visited so far, we knew we needed our own wheels to explore all that Corfu had to offer, an island which is 65 kilometers long and spans 585 square kilometers. Within minutes of being on the island, the romance and luxury commenced. 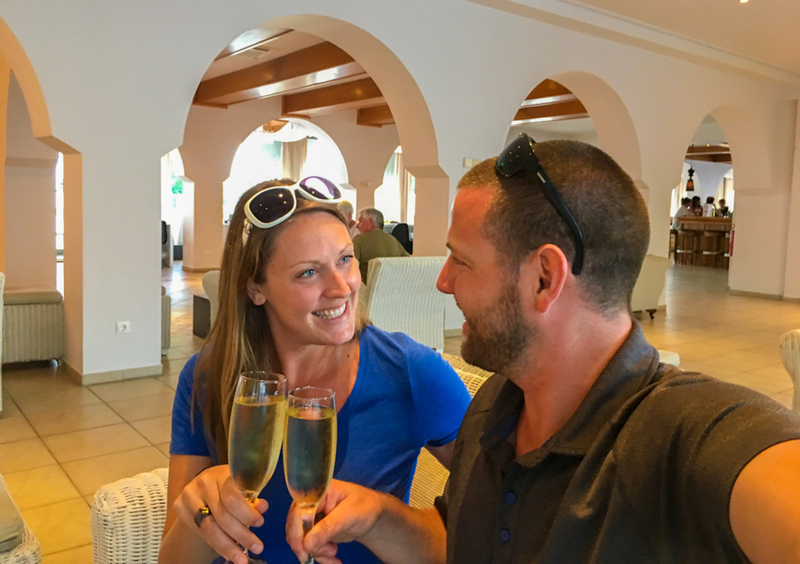 Arriving at the 5 star MarBella Corfu, we were greeted in the dazzling lobby by a smiling receptionist, who then handed us a glass of champagne. Things were off to a great start, but they got even better. Passing by a large outdoor pool, with sun-loungers and bar, we arrived at our room. Our seaview suite for the following four nights was exceptional. With two spacious decks, two bathrooms (one with a bathtub), a living area with a sofa, table and TV, two closets and a comfortable king-sized bed, we never wanted to leave the room. We opened the complimentary bottle of red wine, and snacked on fresh fruits we found waiting for us, while enjoying the view of the sea backed by lush hills. Seaview room at the MarBella Corfu! With just six days to experience as much on Corfu Island as possible, we immediately set off to explore. 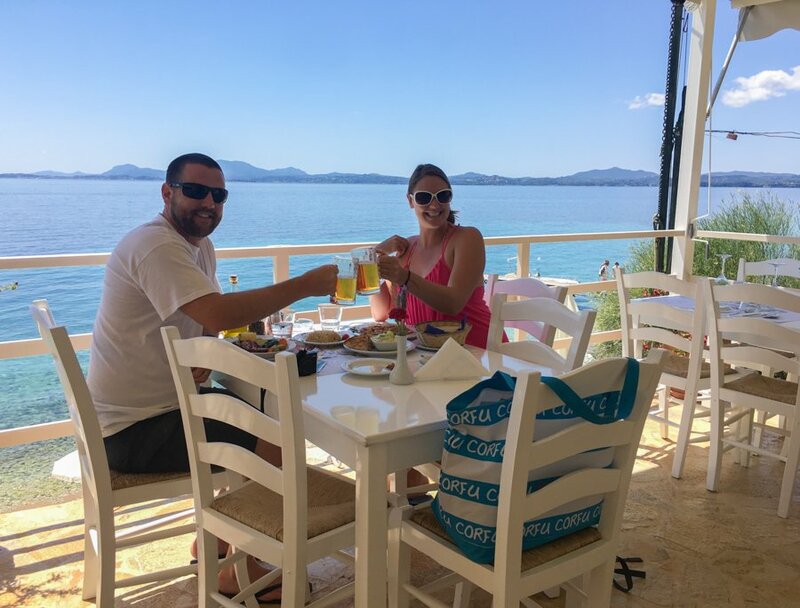 We drove through quiet streets, down unnamed roads and along the coastline – stopping at little tavernas along the way to sample the traditional Corfu cuisine. 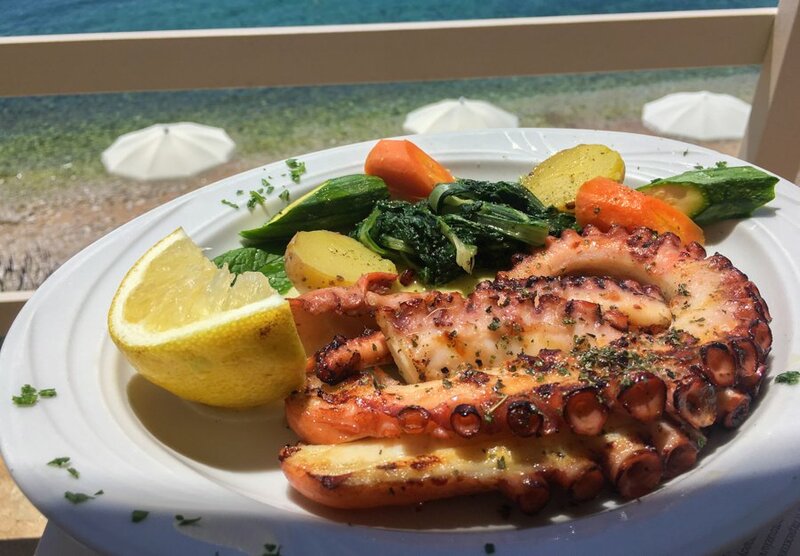 Sofrito, which consists of thin slices of beef cooked in a wine sauce with parsley and garlic, and the freshly grilled octopus with a squeeze of lemon were standout dishes. Local tavernas didn’t rule our whole trip, however, we also dined twice at the incredible Salto Wine Bar in Corfu Town, and the Etrusco Restaurant, which has been awarded best restaurant in Greece, 2017 by Athinorama Magazine! 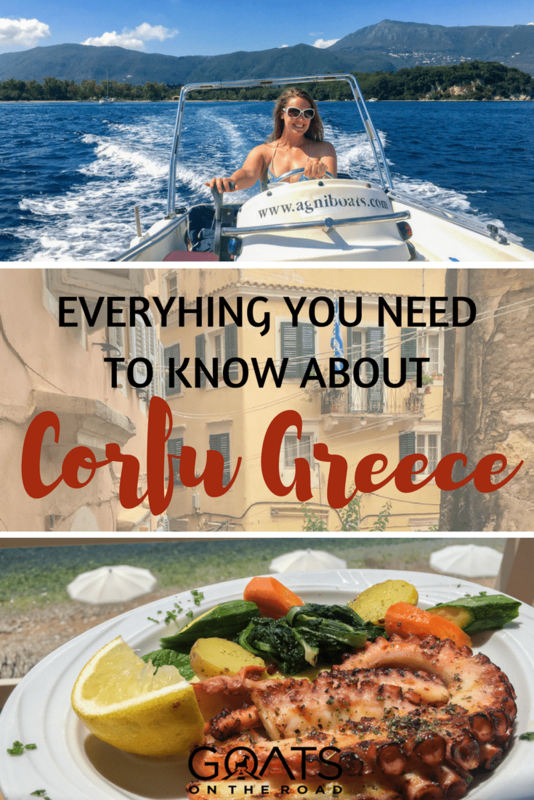 Whether you’re interested in rustic, local food, or something a little more upscale, with a twist on the traditional dishes, you’ll find it in Corfu. There’s no shortage of excellent restaurants on the island. 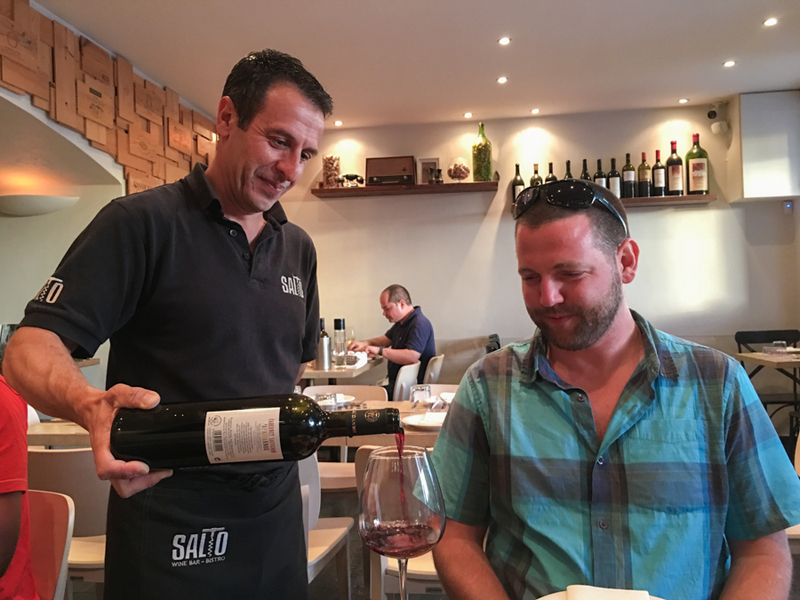 Dining at Salto Wine Bar in Corfu Town…twice! With clouds looming overhead for much of our stay, we were becoming a little disheartened about our anniversary plan, which was to hire a boat independently and explore the coastline. But, if you can believe it, the sun broke through on our special day and we made a beeline to the northeast end of the island, to Agni Boats near Gimari. We were given a little paper map, a rundown on how to operate the boat, and within minutes, we were set free to cruise around the north and eastern part of Corfu on our own! No boat licence needed, no previous experience required. Now, this was the magic we were looking for! This was such a unique way to spend the day, as it was something we had never experienced together. Sure, we’ve been boating in the past, but renting a boat in a foreign country with just the two of us out at sea, this was new. With our summer music blaring on our travel bluetooth speakers and a bag full of booze and snacks, we zipped around to rugged (empty) coves with white sand beaches. We anchored up at local tavernas for lunch and drinks, and jumped off the boat to swim in the clear water. 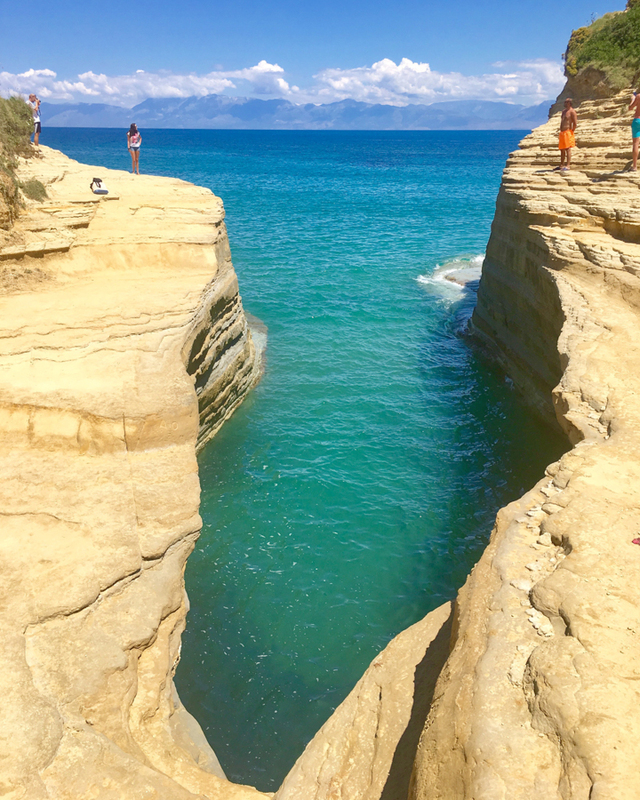 With views of mainland Greece and Albania to the east, the rocky hillsides and pretty coves of Corfu to the west, and no one else around, it was the perfect day. A gorgeous day for a boat ride in Greece! We encountered some wind and waves towards the end of the day, but for the most part, the water it was completely calm. After seven hours spent out on the Ionian Sea, it was time to return our little 45 horsepower boat. 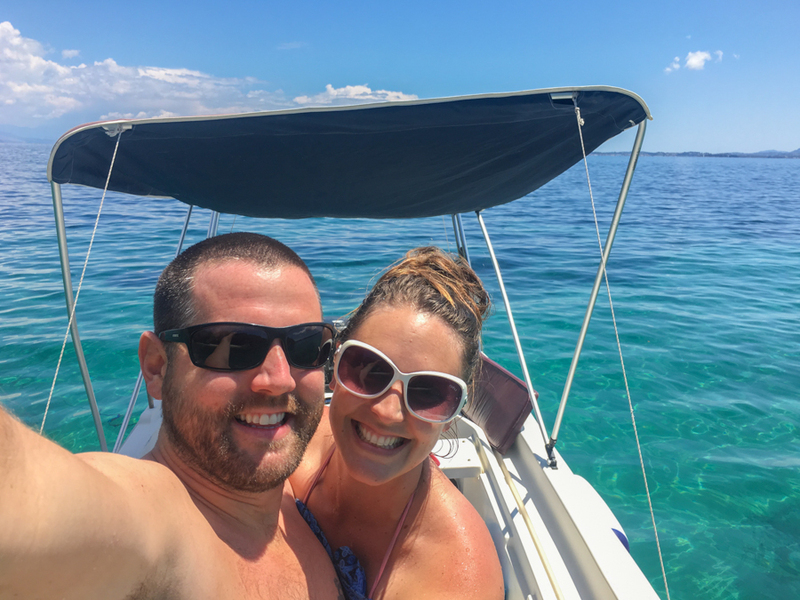 Hiring our own boat abroad was an experience we’ll never forget, and was the ideal way to spend our anniversary. 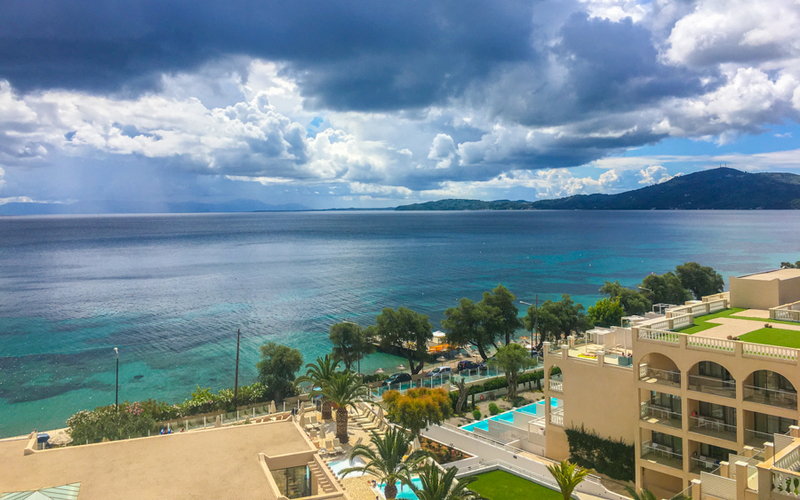 After four nights at the beautiful Marbella Corfu, we checked out and made our way north, where we would base ourselves for another two nights at Corfu Palma Boutique Hotel. We love boutique places, and this unique hotel checked all of the boxes. With just four floors, this low-rise hotel had an intimate feel. We were staying on the 4th floor in the beautiful Superior Design Suite and when we opened the door to our room, our jaws dropped. The room was exquisitely modern, with white walls and beams running along the ceiling. A bright red L-shaped sofa sat in the living area, and paintings from the island hung on the walls. Spyros, the manager, knew that we were working with Discover Greece and had suggested that we stay in the Superior Design Suite which was the best room they had. He thought we would probably need to get some work done, and this room had a table for us to blog at. He also invited us for drinks with him at the hotel bar, followed by dinner and live Greek music on the terrace. Spyros also decided that because we had been travelling around so quickly, we needed some relaxation. So, he booked us in for an hour-long, full body, couple’s massage at the hotel’s Aphrodite Spa! 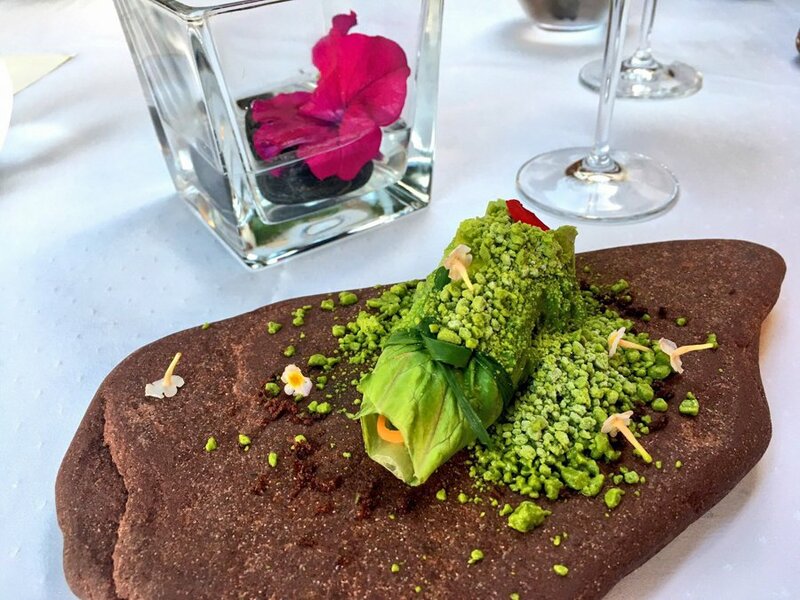 And finally, the generous man suggested we visit the nearby Etrusco restaurant and have a 10 course meal, complete with wine pairing from the famous, Michelin Starred chef Ettore Botrini, who just so happened to be his friend. 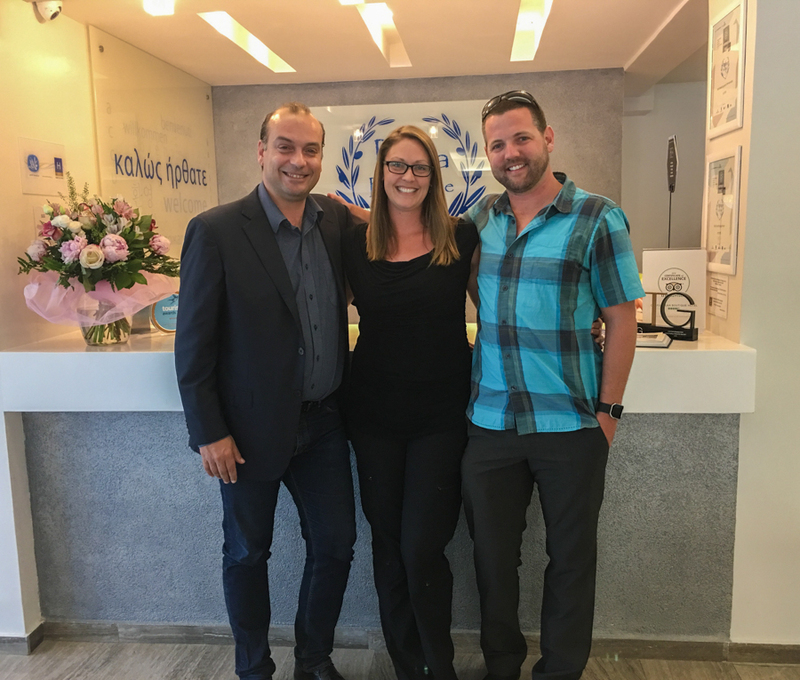 We felt so welcomed and well taken care of by Spyros and his team at Corfu Palma! Not only was the hotel gorgeous and the staff lovely, but the location was great to be able to see the last few things on our Corfu itinerary. We headed up to the very northern end of the island to the Canal d’Amour beach. Immediately, we were in awe of the bizarre shaped, coloured cliffs, which looked like they would crumble if we stepped too close to the edge. It’s said, that if you swim through the Canal d’Amour (love canal), you will get married soon. Now, I don’t know about that, but it was yet another romantic experience during our visit to Corfu. Leaving the love canal behind, it was time to experience some of the ancient products still used today in Greece – olive oil and honey, two of our favourites. The Governor is a family run olive grove and mill on the island. Not only do they make an excellent, award-winning product, but their olive oil has incredible health benefits. In 2014, 700 different olive oils from around the world were scientifically tested in Athens. The results showed that the oleocanthal and oleacein concentrations in The Governor extra virgin olive oil were 7 times higher than the average of the samples tested. In fact, this olive oil is being tested for its ability to cure Alzheimer’s and cancer! The brothers, George and Spyros, welcomed us to the mill with a glass of white wine and explained about olive oil production. We were invited into a cool, stone room, where some premium extra virgin olive oil was poured into a small glass. We were then instructed to warm it with our hands, sip some of the oil and let it slide to the back of our throats. We then breathed in lightly and swallowed. The flavour was bitter, nutty, and spicy, in fact, we actually coughed when swallowing – which (apparently) is a good sign. We coated some local varieties of cheese, and homemade bread with the olive oil, and even had some yogurt drizzled in oil! It was delicious. 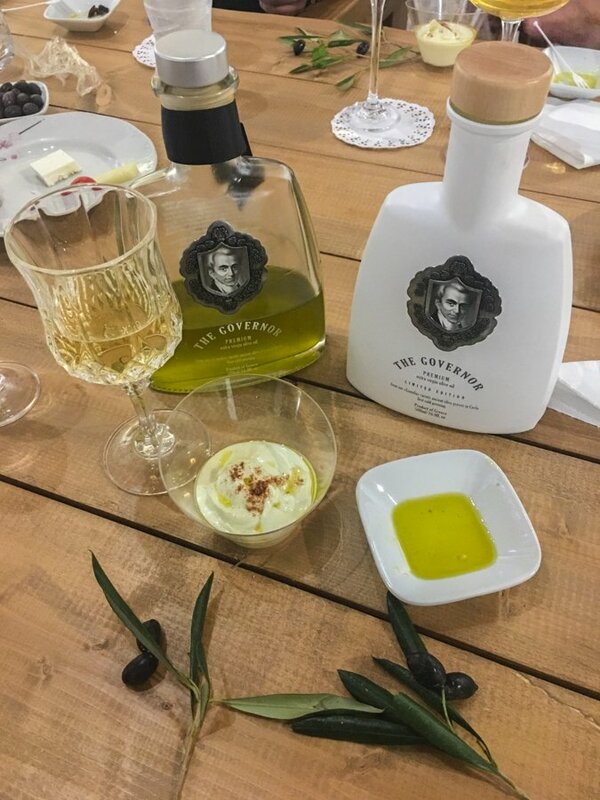 As a gift, we were given a bottle of their premium extra virgin olive oil, which was an excellent addition to our bread and cheese platters during our stay in Greece. 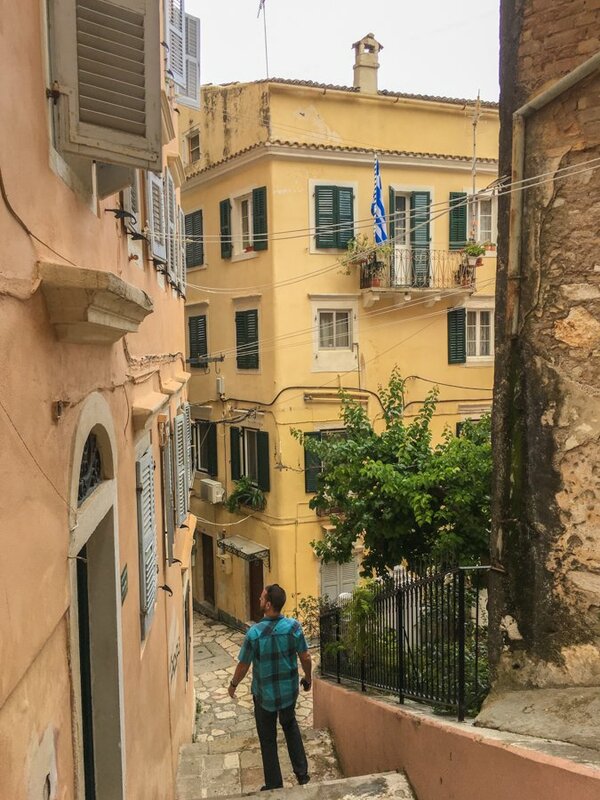 From one liquid gold to the next, we moved on to meet Mr. Honey, a man who left his career as an engineer in Athens, for a quieter life on Corfu Island. Today this beekeeper has 500 hives! Now, I’m as interested in honey and beekeeping as the next person, but when we met up with Panagiotis Vasilakis, Nick’s inner love for bees shone through! He was extremely enthusiastic about beekeeping and honey production. It was hilarious! The two men chatted forever about bees, while I snooped around at the olive oil and pollen products on offer. I may as well not have been there as the two of them were in their own little world, being total bee geeks! It was too funny. 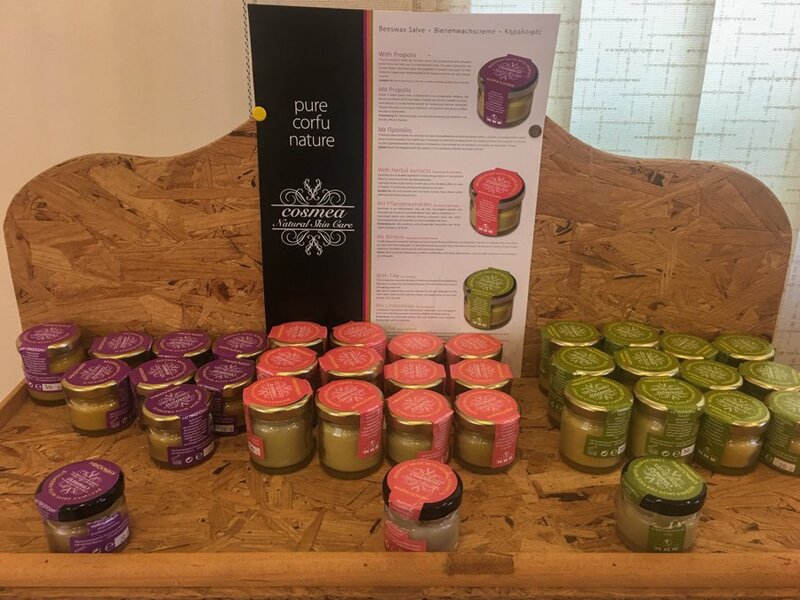 The tour itself is free for all bee and honey lovers, and there are numerous homemade honey products available for purchase, all made with love by Mr. Vasilakis’ wife. By the end of six nights on Corfu Island, we had travelled from north to south and east to west. We ate our way around the island, visited numerous beaches, met some wonderful people, stayed in some stunning accommodations and had a romantic anniversary celebration. Corfu impressed us with its lovely UNESCO capital city, its friendly people and its multitude of activities. 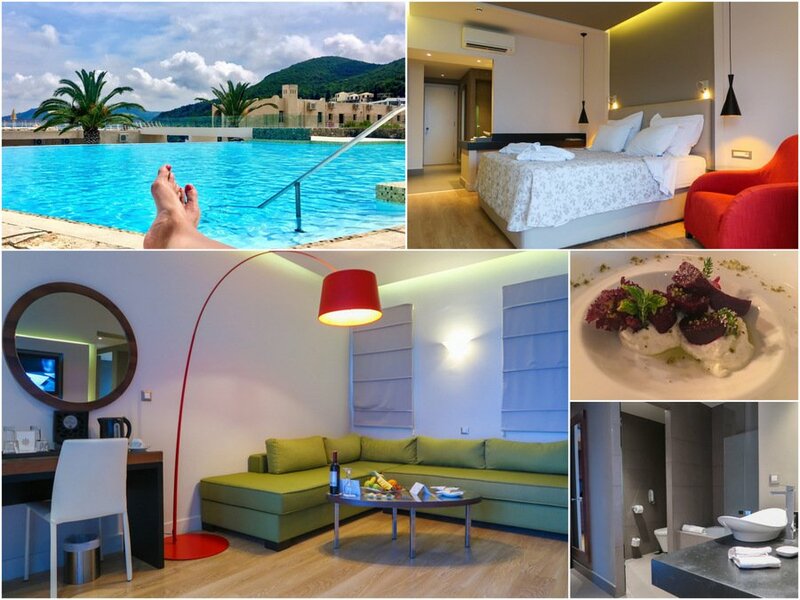 We thoroughly enjoyed the luxury and romance on offer in Corfu! If you haven’t travelled to this Greek island yet, add it to the list! We flew from Kefalonia to Corfu Island with Aegean Airlines. Click here to see their flight costs and times. I suggest having a rental car to explore all that Corfu has to offer. We rented our car through Expedia.com, which searches through the cheapest rentals available. The further in advance you book, the cheaper it will be. 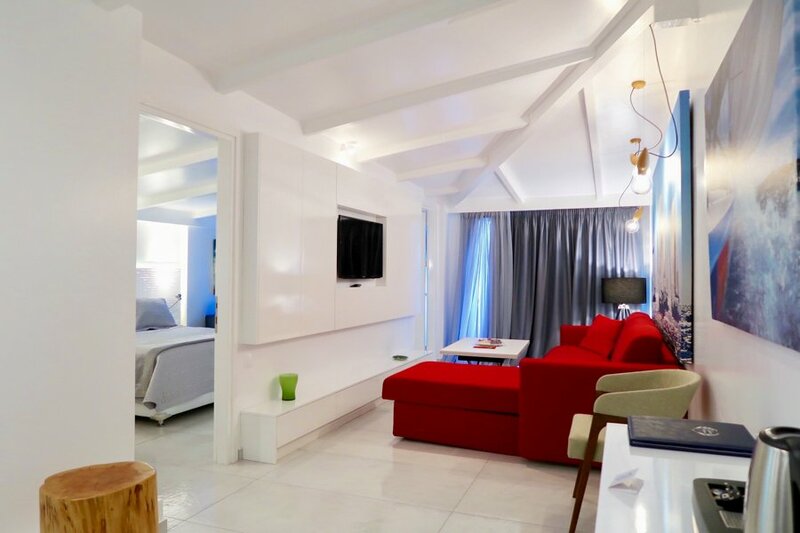 For accommodation options, we can recommend Corfu Palma Boutique Hotel for a great small hotel, and MarBella Corfu if you’re looking for more of a luxury resort feel. Hiring a boat is such a unique way to spend the day! The cost was €80 (discounted from €120) for the day, plus €40 for gas. The boat can fit 4 people comfortably. 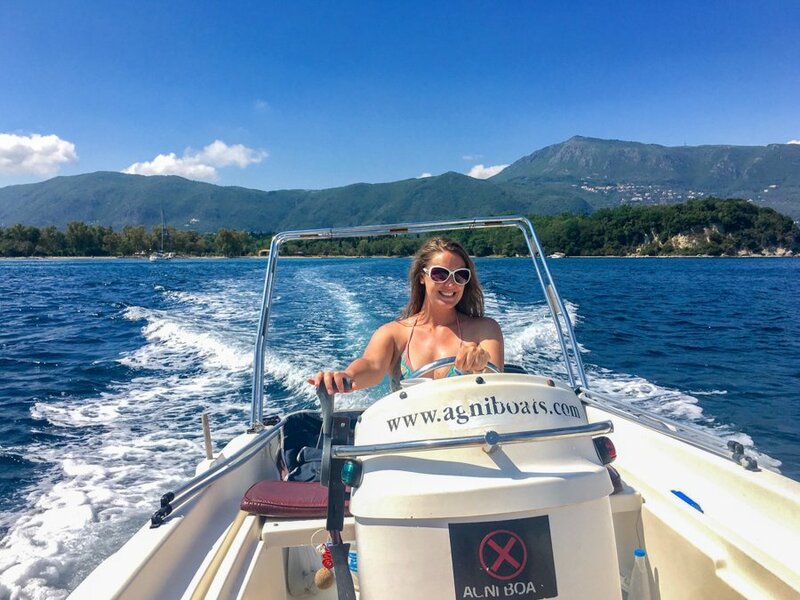 We booked with Agni Boats and had a positive experience. You can email them at: [email protected], or check out TripAdvisor here. Be aware, there is another company pretending to operate as Agni Boats, so call them to confirm it’s George and Alex who are the owners as we can’t speak for the other company! Visit Corfu Town both during the day, and in the evening. The lighting of the UNESCO town at night is stunning. Recommend Restaurants: Salto Wine Bar (we spent €35 for 2 appetizers + 2 main courses), Akron Beach Bar (lunch for two of us was €20), Taverna Glyfa (lunch for two of us was €30), Etrusco (set menu starting from €70 / person) and Taverna Savvas (lunch for two of us was €29). We didn’t have a chance to eat or drink at 7th Heaven or Archontiko Restaurant, but heard that they were both very good. Don’t miss seeing the Governor’s Mill! 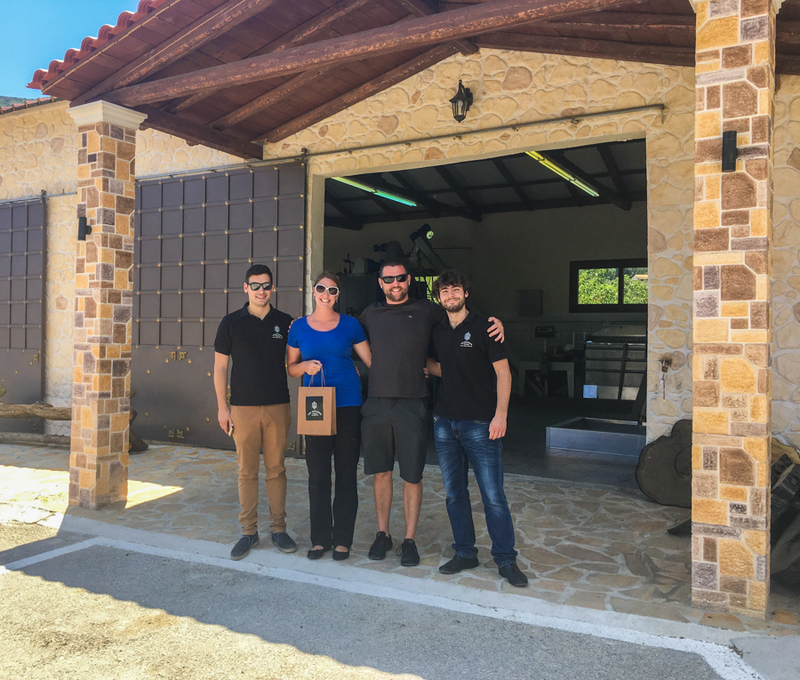 The family who runs this place are lovely, and the brothers Spyros and George are incredibly passionate about their product. Tours cost €30 / person including an olive grove visit, a tour of the mill, and the tasting as well. Click here for their website, and click here for their Facebook Page. If you’d like to meet a very interesting man, and learn about beekeeping and honey production, then definitely take a trip to see Mr. Honey! His shop is called MKV – Melissokomiki Kerkyras Vasilakis, which is located here. The tours are free. Check our our Travel Video From Corfu Island! A huge thank-you to Discover Greece for assisting with our flight, accommodation and olive oil tour during our trip to Corfu Island! The rest of Corfu we planned, booked and paid for ourselves. All opinions and thoughts remain our own, despite any complimentary services received. All I want to say is THANK YOU SO MUCH FOR SHARING THIS DETAILED EXPERIENCE.